My favorite short story as a kid, was Sredni Vashtar by H.H. Munro, who wrote under the name of Saki. In the story, Conradin, who is being tormented by the aunt whom he lives with, dreams for deliverance. To obtain it, he prays to his secret pet ferret that he worships as a god. A dog in this story substitutes for the ferret and a father replaces the aunt. The plot however, is very different from Saki's. I kept the name Conradin to show my debt to Saki. To avoid frequent beatings by his abusive father, Conradin spends as much time as he can at his best friend, Henry's, house. Henry's mother is an animal trainer and the family has a dog and an African Grey parrot as pets. After learning that trained animals usually do their tricks in response to subtle hand gestures, Conradin suggests that he and Henry try to train the Parrot to understand the dog's body language and speak what the dog is 'thinking'. Later, through the dog's apparent human speech, Conradin's life is completely changed. Published in Analog Magazine, 2007. Two young brothers confront war and death in a zoo where the animals are micro-organisms. Of all the short stories I've written, this is my favorite. In English, the story was well-received, but not nearly as well as when it appeared in Russian translation in the magazine ESLI. It has now been translated into Czech as well. The story was on the LOCUS 2006 recommended reading list. More important to me than any review of the story was a response from a young medical officer writing from a navy ship returning from Iraq. He had experienced many horrors. Understanding that 'Paramecium' was really about the human costs of war, he was moved by my story—and I was deeply touched by his. 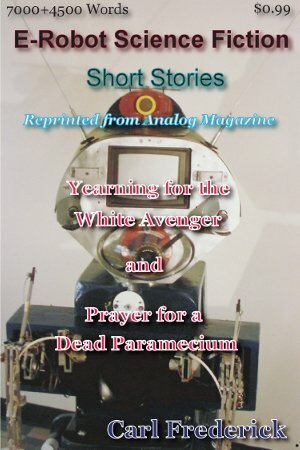 The story appeared first in Analog Magazine in 2005.